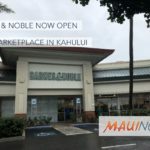 Maui Now : Is the Current Summit Eruption a Return to Kīlauea Volcano’s Past? On November 5, 1967, a line of vigorous lava fountains erupted on the floor of Halemaʻumaʻu at the summit of Kīlauea. Lava soon covered the entire crater floor as volcanic gases billowed skyward (aerial view). Near the center, a pool of molten lava repeatedly overflowed a levee of crusted lava, spilling flows onto the lava-covered crater floor (inset). The 251-day-long eruption ended on July 13, 1968. USGS photos by W. Kinoshita (aerial) and R. Fiske (inset). As the anniversary of Kīlauea Volcano’s current summit eruption approaches, this week we revisit the history of past Halemaʻumaʻu eruptions. We do so by reprising parts of a Volcano Watch article written in December 2008, soon after the ongoing Halemaʻumaʻu lava lake reached a milestone as Kīlauea’s longest summit eruption since 1924. That year is used as a frame of reference for Halemaʻumaʻu eruptions, because 1924 ended a 100-plus-year period of nearly continuous lava lake activity at the summit of Kīlauea. 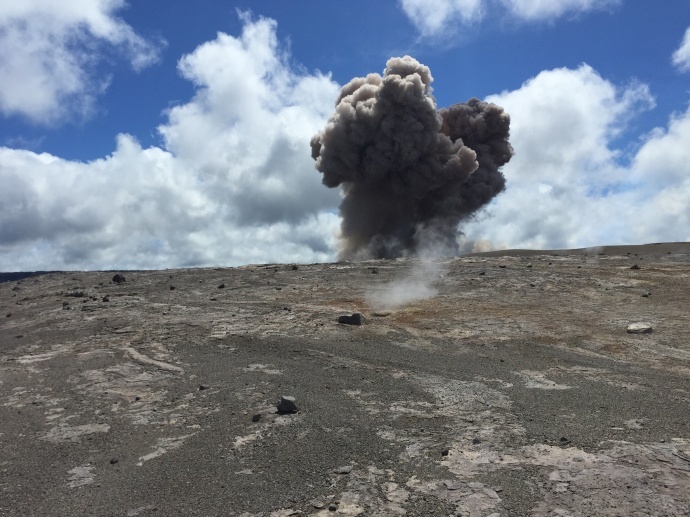 Historically, a summit eruption has been the “normal” for Kīlauea Volcano. However, in the 19th and early 20th centuries, Halemaʻumaʻu looked much different than it does today. It was an irregular landscape of craggy spires and islands with as many as six transient lava lakes. But in May 1924, the long-lived lava lake that existed in Halemaʻumaʻu drained away, resulting in explosive eruptions that doubled the diameter of the crater to about 3,000 feet. Afterward, Halemaʻumaʻu looked much the way we see it now, except that it was almost five times deeper than it is today. Since then, Halemaʻumaʻu has erupted 18 times. 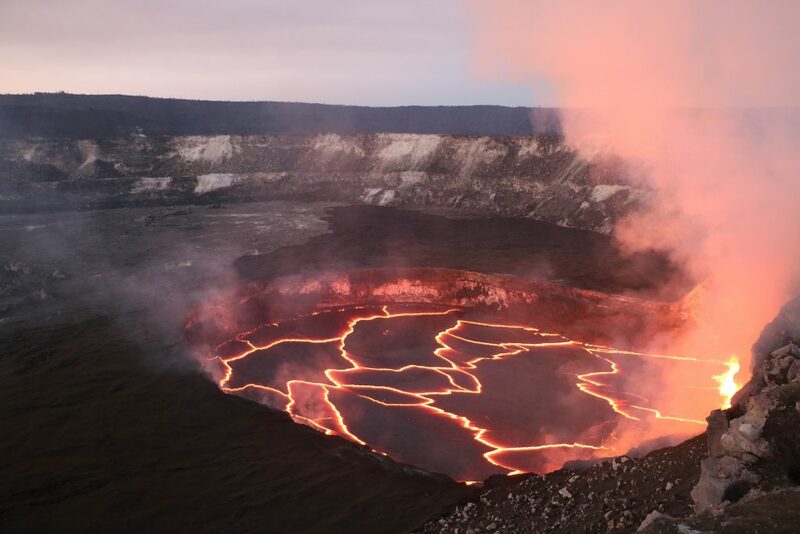 The first was in July 1924, when an 11-day eruption formed a small pool of lava on the crater floor. Over the next 10 years, six eruptions—in 1927, 1929 (two), 1930, 1931, and 1934—took place within Halemaʻumaʻu. They varied in duration from two to 33 days, but each eruption added a layer of molten rock to the crater floor. With thicknesses averaging about 60 feet, these layers reduced the depth of Halemaʻumaʻu to about 800 feet. The end of the 1934 summit eruption marked the beginning of Kīlauea’s longest period of quiet on record. For nearly 18 years, there were no eruptions anywhere on the volcano. Kīlauea made up for lost time when molten lava returned to Halemaʻumaʻu in June 1952. That spectacular eruption went on for 136 days, with lava fountains sometimes visible above the crater rim. By the time it ended, the eruption had filled the crater with more than 390 feet of new lava. Over the next 30 years, Halemaʻumaʻu erupted nine times—in 1954, 1961 (three), 1967‒1968, 1971, 1974, 1975, and 1982. These eruptions varied greatly in duration, from about 7 hours (1975) to 251 days (1967‒1968, the second longest summit eruption since 1924). 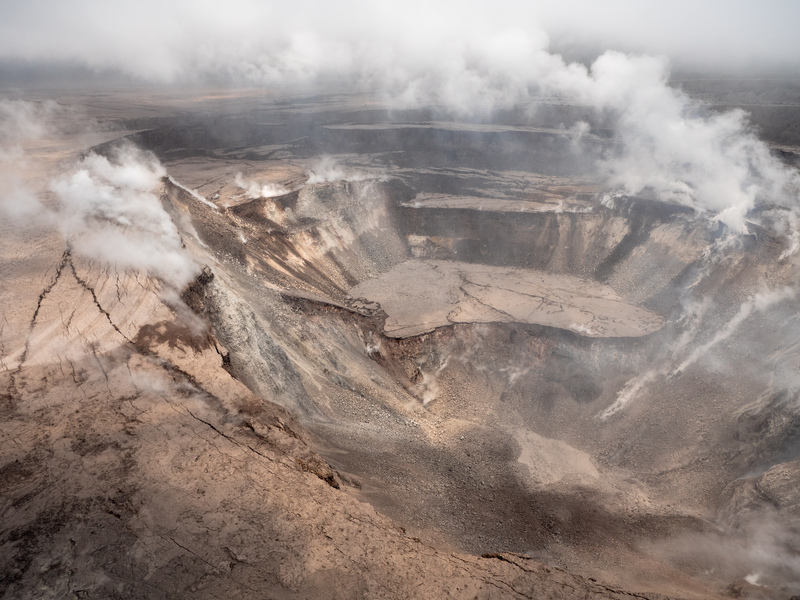 Today, the floor of Halemaʻumaʻu is about 280 feet below the crater rim. Most of the rock covering the crater floor was emplaced during the 1974 eruption, which lasted less than a day. The 1974 lava fountains, up to 330 feet high, initially erupted on the northeast rim of Halemaʻumaʻu, and then migrated as a fissure across the crater floor and up the west crater wall. Molten lava quickly engulfed the entire crater floor, except for the tops of three high spatter cones created during the 1967‒1968 eruption. 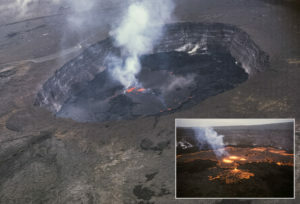 In April 1982, a fissure that opened on the caldera floor northeast of Halemaʻumaʻu erupted low lava fountains for 19 hours. Lava flows spread north and south of the erupting fissure and into Halemaʻumaʻu, covering about 76 acres, including a “puddle” of lava on the floor of the crater. 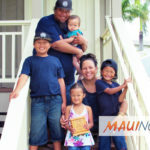 Each Halemaʻumaʻu eruption between 1924 and March 2008, when the current summit eruption began, has its own unique story. Most of them, however, describe activity strikingly similar to what we are now experiencing—emissions of sulfur dioxide gas, ash-rich plumes, and poor air quality—but only a few produced a lake of lava like the one that exists today. Kīlauea Volcano’s ongoing summit eruption reaches its 10th anniversary on March 19, 2018. This past week, Kīlauea Volcano’s summit lava lake level fluctuated with summit inflation and deflation, ranging about 75–128 feet below the vent rim. On the East Rift Zone, the 61g lava flow remained active downslope of Pu‘u ‘Ō‘ō, with scattered breakouts on the pali and coastal plain, but no ocean entry. The 61g flows do not pose an immediate threat to nearby communities.